Use TeachToTell STYLISH, LOOP DE LOOP, and DIVERSITY for personal and commercial use. 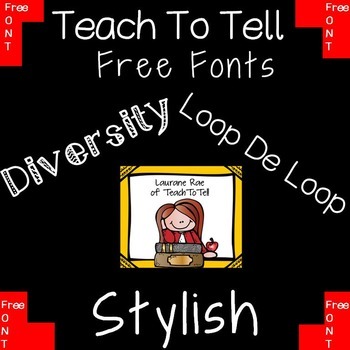 All fonts have ‘TeachToTell’ in the title to facilitate ease of differentiation. This font features 98 glyphs and includes the basic letters of the English alphabet a-z in both uppercase and lowercase. There are also standard keyboard symbols, punctuation and numbers. Thank you for downloading these free fonts. Feedback is greatly appreciated. If you're looking for some decorative and/or handwriting fonts, click on the links below. SAVE HEAPS WITH THIS 101 FONT BUNDLE!